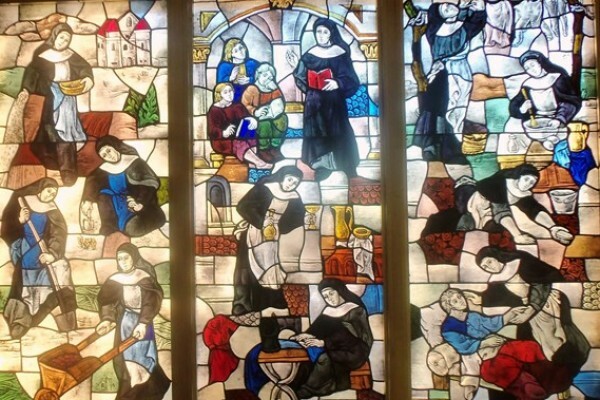 Editor’s Note: At the Provincialate in Des Plaines, IL on the feast day of Blessed Mary Stella and her Ten Companions, Sr. Marie Kielanowicz, CSFN, presented this reflection during Mass. With her permission, we share it here as we remember the sacrifice of our Martyred Sisters. Each year, we celebrate the feast of eleven Sisters who were martyred 75 years ago in a lonely pine and birch forest in Nowogrodek, Belarus. Every year on September 4th, we remember Sisters Stella, Imelda, Raymond, Daniela, Canuta, Sergia, Gwidona, Felicita, Heliodora, Canisia and Boromea, – women whom the Church holds up as shining witnesses of the Gospel message of love. And, we remember too, Malgorzata, the lone survivor of that community, the “white martyr” who lived her martyrdom for all the years following the execution of her sisters. I often wondered why the Church designated September 4th as the feast day of the eleven martyrs. Then, a few days ago, I discovered that our first Sisters arrived in that town on the far eastern edge of Poland on the fourth of September, 1929. In the mind of providence, perhaps, it was to be a date with destiny. Two qualities dominate my thoughts these days as I reflect on the lives of our sisters: the first being their simple ‘ordinariness’ and the second, their deep prayer and faith. First, the eleven sisters were just ordinary women, doing their everyday work in one small corner of the world – all the while trying to live out their consecration to God in service to His people. In that respect, we are very much like them – each of us living our daily lives, doing the best we can, trying to grow ever more faithful to the following of Christ we profess. The eldest was 55, the youngest 27. They were diverse in temperament and personality, not sugar-coated saints, but women both graced and flawed as we all are. Some were healthy and strong, about half had serious health conditions. Some were shy, quiet, and sensitive to criticism; others had to struggle with their fiery, impetuous, and demanding temperaments. Three were from affluent families, one even from nobility; most, though, came from poor peasant families and had little or no formal education. A few served as teachers or catechists, the majority worked on the farm, in the kitchen and laundry or cleaning the school. They cared for the ‘Fara’, the historic white church on the hill, and organized religious services for the faithful. Their simple lives were a source of inspiration to those who witnessed their prayer and daily self-gift as faithful followers of Christ. The quiet example of their lives, not so much what they did, inspired the people and spoke volumes. It seems than many, if not most, of the Sisters were quite unknown to the villagers, for their humble ministry was carried out in the shadows, not the limelight. 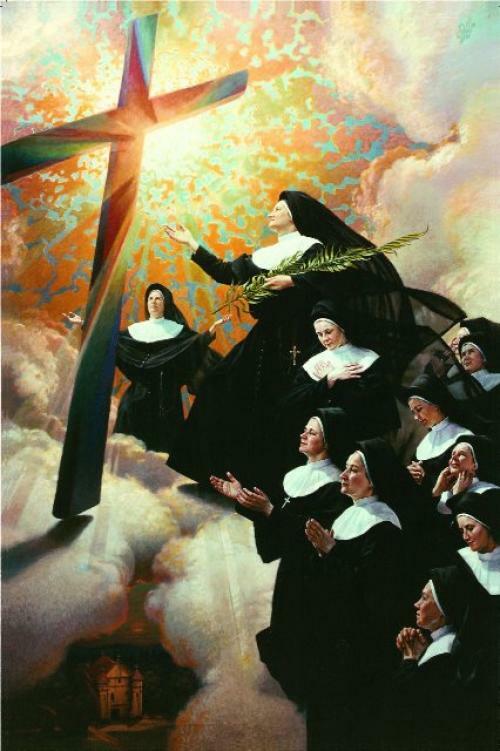 As we contemplate the life, death and glory of our martyred Sisters, we celebrate not only of the greatness of their lives; in them we see the best of who we are called to be and are reminded of the promises we have made. What they have lived - humbly, simply, and then with unspeakable courage and faith as they walked towards an empty grave – we, too, are challenged to live. We will probably never be faced with the terrible reality that confronted them, but daily we are called to a dynamic faith as we live out our ordinary days, walking the narrow way that leads to life. “They shall dart about as sparks through stubble” (Wisdom 3) the Scripture says – shining through the darkness, “the snare broken,” their souls in glory…for having lived the words of the Lord: “There is no greater love than this than - to lay down one’s life for a friend” (John 15:13) both in the simple, generous lives they lived, and the valiant, heroic death they endured. Blessed Martyrs of Nowogrodek, pray for us. Homily of Pope John Paull II at the Beatification Mass in St. Peter’s Square in Rome, March 1, 2000. Reverend Alexander Zienkiewicz. (Sisters’ Chaplain. Witness during the Beatification Process) and author) “No Greater Love.” Rome. 1968. P. 15.